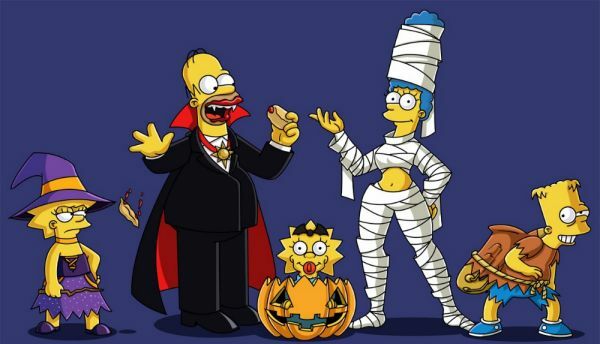 FXX will celebrate Halloween with a The Simpsons "Treehouse of Horror" programming event culminating with a 13-hour marathon on Monday, October 31. The marathon will air 26 episodes of "Treehouse" in season order (seasons 2-27) beginning 11am ET/PT and concluding at 12am ET/PT. The week prior will feature six nights of themed "Treehouse" mini-marathons during primetime starting tonight on October 23 through October 30. FX will separately feature a Halloween Weekend Movie Marathon. The Halloween weekend begins on FX at 11am ET/PT on Saturday, October 28, with the showing of Riddick followed by Abraham Lincoln: Vampire Hunter, Dracula Untold, The Purge, and back-to-back showings of The Purge: Anarchy beginning at 8pm. The marathon resumes at 11:30am ET/PT on Sunday, October 29 with another showing of Abraham Lincoln: Vampire Hunter and Dracula Untold, followed by The Book of Life at 4pm, Hotel Transylvania, and back-to-back showings of the world broadcast premiere of Hotel Transylvania 2 at 8pm. The marathon ends with Surrogates at 12am. Better Things, the Peabody-winning comedy series co-created by and starring Pamela Adlon, has been renewed for a third season. The third season will air on FX in 2018. Better Things, currently airing its second season, centers on Sam Fox (Pamela Adlon), a single, working actor with no filter raising her three daughters, Max (Mikey Madison), Frankie (Hannah Alligood) and Duke (Olivia Edward) in Los Angeles. She's mom, dad, referee and the cops. Sam also watches out for her mother, Phil (Celia Imrie), an English expatriate who lives across the street. Sam is flawed and fierce with her love for her daughters, and her own mother as well, sometimes heaping the love on when she feels guilty. Sam's just trying to earn a living, navigate her daughters' lives, have fun with a friend or two and also - just maybe - squeeze in some private time once in a while. Adlon, who directed all 10 episodes of the second season, serves as writer and Executive Producer alongside Louis C.K. Additional Executive Producers include M. Blair Breard, Dave Becky and 3 Arts Entertainment. Better Things is produced by C.K. 's production company Pig Newton for FX Productions. Better Things won a Peabody Award in 2016 for its first season and Adlon was nominated for an Emmy(R) for Outstanding Lead Actress in a Comedy Series.